For Environmental Analysis, it is the responsibility of the sponsor to sample their facility according to their procedures. 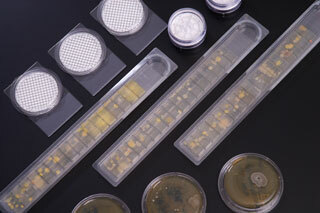 Once the samples arrive at our lab, they are incubated and enumerated. If the samples require any manipulation before incubation, please contact the lab prior to sending. Results: The total count may be expressed in several different ways depending on the type of sample and sponsor preference. Examples include: colony-forming units (CFU)/plate, CFU/filter, CFU/m3, or CFU/cm2. At the sponsor’s request, samples may be retained for identification or Gram stains. Unless otherwise specified, tested samples will be discarded seven days after the study has mailed.